I wrote and scheduled this post a few weeks ago, but the day it planned to post it, we found out my husband’s dear twin brother, Caleb, was diagnosed with a rare form of blood cancer. We’ve been heartbroken but full of hope — read more of his story here. We are grateful for this Christmas season, and all the joy-surpassing-circumstances it represents. I am so excited for Christmas decorating this year! I think it’s partly because Weston is getting older and he’s already looking forward to the holidays and often talks about Christmastime. Having little ones is such a joy, especially during the holidays. I shared on my Instagram stories over the weekend that I’d post here all about my Christmas home aesthetic and give you some tips on how I attain the style on a budget — ‘cause, you know your girl loves a good deal! I’ve dubbed my personal Christmas decor aesthetic as “Glam Vintage Farmhouse Christmas” — a mix of glamorous and rustic, trendy farmhouse elements and classic vintage touches. Cozy, bright, cheery, and untraditional but homey and happy. 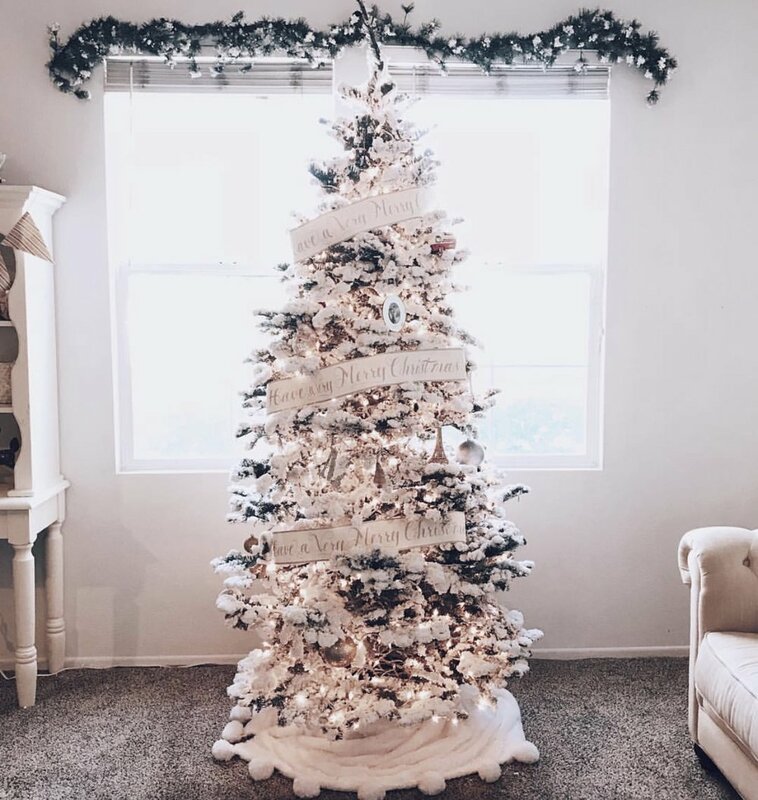 Before you even get started on decorating, before you pull out those dusty garage boxes or spend an afternoon getting lost in the Home Goods holiday section, sit down, put pen to paper or open up your phone notes, and make a clear list of items you need for decorating. Hopefully you have most of these, already. But, write it down. The basics and the extras you’d like to include in your decor. Go by room and write down each item that will be a part of your decor. After your list is made, go through all the things in the garage or attic. Open those boxes, and decide what things you’ll use, which items you have and love (cross these off), the items you will need to replace, and then mark on your list the items you need to purchase. This eliminates mindless spending (SO easy to do, I know that well!) and will keep you focused on what you need to buy. It’s always fun to look and shop, but I always breathe a sigh of relief when I know exactly what I’m going into Hobby Lobby for and I don’t overspend when I walk up to that register. It’s so so tempting to just add random things into your cart, so determine your list and your budget before ever entering a store or going online to shop. Then, you can also think up creative DIY budget-friendly ways to create what is on your list, and maybe you’ll save a ton of cash and come up with a unique idea! Scour antique stores for real vintage Santa mugs. I’ve seen so many for such good prices! And they are the real deal. So pretty for decorating, for a Christmas party, and for fun Christmas photoshoots, too. Use a Throw for your Tree Skirt. I grabbed a pom pom one at Home Goods for $20. Cheaper and cute! Scour the Target Dollar Section, every week. Be careful to not burn through cash buying random trinkets. Look back at your list for items you need or want for your decor, and then think up creative ways you can use Target Dollar Spot items to replace or make-into the item on the list. For instance, for my dinner table centerpiece, I use a wooden sled I bought last year for $3 at the Dollar Spot! Dollar Tree and 99 Cent Stores are your new bestie! Yes, 90% of the items are tacky and cheap looking (sorry Dollar Store!!) but, they always have at least one or two GEMS in the midst of it all! You just have to search, have an open mind, and think creatively. It also helps to look online at shops like Pottery Barn, etc, and look at what is “in” and beautiful, quality, in style, and lovely, and then look for things you can use to emulate the look. Look around the thrift store. Seriously! I’ve found gems there often. Like my $1 coffee table, remember it from my Instagram posts a few weeks back? :) You can always paint anything white. Start looking around with eyes that see furniture and other items through the lens of white-paint. It will change your life, haha! Vintage Christmas postcards and stickers add lovely touches to wrapping! I found these through Kelle Hampton’s blog last Christmas and loved them!!! Amazon still has them. Have your kiddos cut snowflakes out of white paper and hang them in the windows. For our outdoor decor, I only buy items at Dollar Tree and Walmart. It’s outside, in the weather (not that we have that much “weather” to speak of here in LA haha), and it’s mostly just for fun, to make our little guy happy and spread cheer to our neighborhood. Fill one of your glass flower vases (I know we all have a few lying around) with extra ornaments you don’t decorate with. I always do this, and it’s a free way to add a festive touch since you already have these items! String Christmas cards from family and friends on some twine, hang with a couple of nails or tacks, and hang them with tiny clothing pins. And waa laa! A sweet, meaningful almost cost-free decoration. I found the most DARLING French Toile black and white holiday themed pillow at Target — it fits this aesthetic perfectly! Last year, I wanted to hang small boxwood wreaths on our kitchen cabinets. I saw this idea a few times on Instagram and Pinterest and there are lots of small boxwood/greenery wreaths “out there” but they are all about $10 for each wreath. With 12 cabinets, that could add up to be more than I wanted to spend on this corner of my home! So, I decided to DIY it. 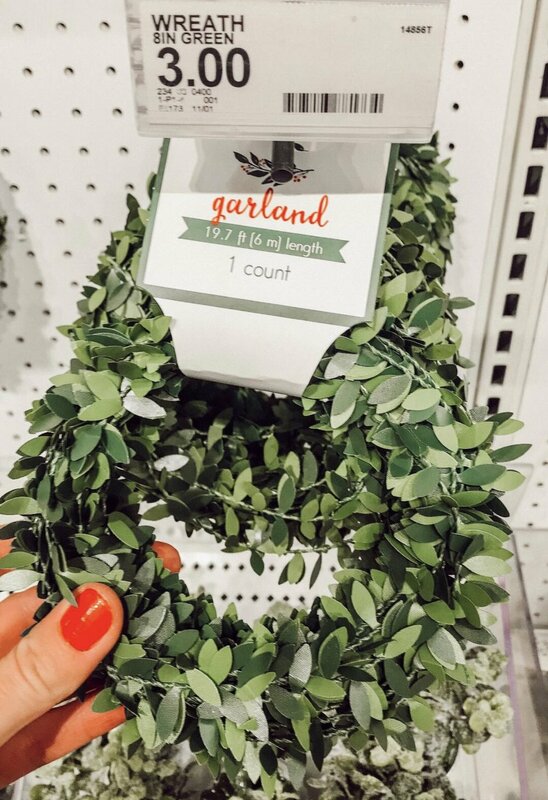 I saw and bought 2 boxwood garlands in the Target Dollar Spot — each strand was $3. And Daniel so sweetly made my idea come true! We just measured out the length of the “wreath”, cut and tied them together (the garland is wired so it easily cuts and ties together) and hung them on red and white Baker’s Twine that I bought at Target (here is some identical twine from Amazon) We taped them to the back of the inside of our cabinets, and… the idea came to life! The Dollar Spot garland — they have it this year, again! So, run — don’t walk — and get yours! This year’s! And we kicked it up a notch by adding white twinkle lights all around the cabinets, too. Extra magic! Our living room so far this year! We decorated last night. Thank you Lord for Christmas and all the hope and joy-beyond-circumstances, and meaning it holds.